On Facebook I keep mentioning the “Hands On Houston” activities held the first Saturday of each month at the Houston Center for Contemporary Craft. I never do followup with examples from our activities. 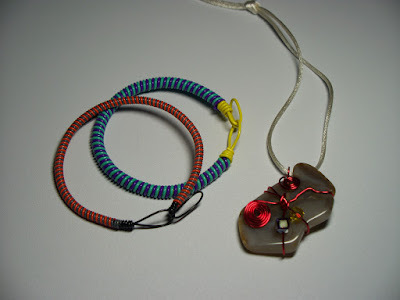 This month we had a ‘wrap a rock’ session as well as a wire wrap bracelet. The crowd was amazing. Not sure if it was because this was a holiday weekend but we were busy for the entire 4 hours. Everyone took home a fabulous art piece. I love what the kids do as they have no preconceived notion as to what something should be. Their results are always the most unique. Some adventuresome folks did both projects. I hear next month is silk painting. Can hardly wait.